Yup, I still have leftover Vippies calendars because I didn't make my usual Xmas calendar party favors. But not to worry, I can include these with my Valentine cards. Click on the images to see them close up. They are simple to make and require only a few supplies. I start with a 9" x 3-1/2" strip of printed cardstock. From the left, I score at 3.5", 7", 7.75", and 8.5" . Then it is a simple matter to fold in the pleat and double stick it closed. 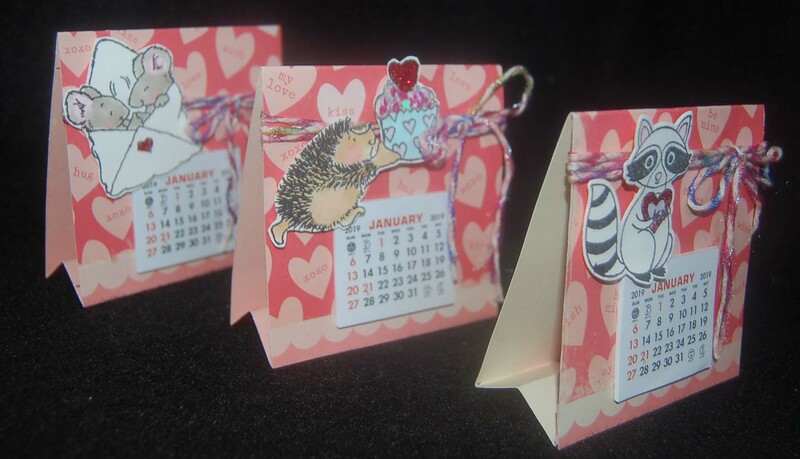 The cute animal images were stamped on marker paper (from HM Ben Franklin Crafts) and fussy cut. (The Hero Arts raccoon set has a matching die set.) 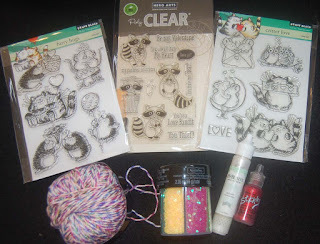 I sparingly colored with Copic pens and added some Bo Bunny pearlescent paint, red Stickles, heart sequins, and twine. I might try making larger versions of this project so I can use up my larger sized calendars and then they can double as Valentine calendars and cards. Hugs and Hearts to you! So pretty! You make the cutest gifts! Great idea! I have lots of calendars I haven't had time to use so your idea is perfect! Thank you for this great idea!